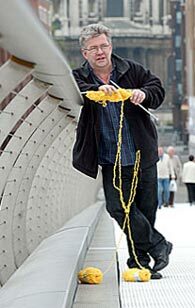 a performance of words, music and knitting..
HAT is four new stories about wool and knitting written and performed by poet and BBC Radio 3 presenter Ian McMillan with music composed and performed by Billy Jenkins. Featuring Andy Diagram (ex James) on cornet, loops and samples and Angie Harrison (ex Hallé orchestra) on viola and knitting needles. Conceived and produced by Simon Thackray. Tickets include a FREE ball of wool, needles and HAT pattern. HAT was performed at the Viaduct Theatre, Halifax, Sir Jack Lyon’s Concert Hall, York, Live Theatre, Newcastle, Helmsley Arts Centre, Everyman Palace Theatre, Cork and Union Chapel and Victoria and Albert Museum, London. Knitted Elvis Wigs – brainchild of Simon Thackray, designed by Sirdar. Knitted Elvis Wigs – Vogue Knitting and No.1 on Google! The Shed Comes To Town – and Malton comes to life!